With requests for L. Ron Hubbard’s books now arriving from locations as distant as Cairo and Tel Aviv, Mr. Hubbard determined that a more central location was needed to monitor the growth of international Scientology. Thus was established the Founding Church of Scientology in Washington, DC. Moreover, with that new Church came something else: the first Scientology Academy—the Academy of Religious Arts and Sciences. While these organizational developments marked a first, the story of technical advance likewise presented a monumental picture. 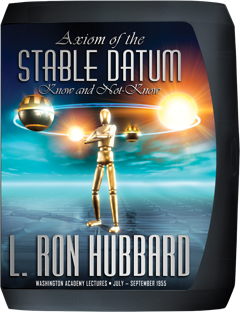 Specifically, with the discovery of one of the most far-reaching principles in Scientology, Axiom 53 (the Axiom of the Stable Datum), L. Ron Hubbard had found an answer to all aberration and the basic theory of sanity or ability. And making its entrance in step with Axiom 53 came another milestone—the four postulates that let the thetan to his fall from native state and the processes for their resolution. Mr. Hubbard concurrently hatted auditors on how to disseminate, providing them with The Scientologist: A Manual on Dissemination of Material, and an article, “Start That Practice!” in which he detailed how to carry the torch for success. By the summer of 1955, the Hubbard Association of Scientologists International in Phoenix had grown to eight buildings and a sizeable full-time staff. As for why, with ACC graduates now spearheading expansion across their geographic zones, the combined force of Scientologists was making their influence felt across the planet. British Scientology, with five hundred auditors, stretched from Liverpool in the north of England to Croydon in the south. Auditors by the dozen were training in South Africa. Scientology had taken root in Australia and New Zealand was booming. Nor was that all. News of L. Ron Hubbard’s breakthroughs had circulated so broadly that requests for books came in from locations as distant as Tel Aviv and Cairo. All the while, coast to coast in the United States, expansion continued to drive forward. Realizing that a more central location was needed to monitor the growth of international Scientology, Mr. Hubbard decided to move to Washington, DC. Thus, in July 1955, with a Distribution Center established in nearby Silver Spring, Maryland, to publish and disseminate the materials, the Founding Church of Scientology was established at 1845 “R” Street NW. More to the point, that new Church also saw the establishment of the first Scientology Academy—The Academy of Religious Arts and Sciences. “With the arrival of the concept that the highest knowingness that you can reach is not to know about anything, we have crossroaded with all of the philosophies of the East and have gone beyond. We just left the human race. “They’re the two basic decisions of this universe: Survive, Succumb. And those are the two stable data. “He’s lying in a hospital bed, he’s living in misery and pain and he reads Dianetics: Evolution of a Science or something like that and he all of a sudden says, ‘Hey! Wait! This—bang!’ and he gets up and he’s not sick anymore. Magic! Pure magic! It really is one of the two stable data. Ideal State for a Thetan—to forget and remember selectively—and how Scientology is a method by which an individual can Know or Not-Know at will. “With this issue and material under development, the goals, the rosiest ones, of Dianetics and Scientology are becoming an actuality. Toward that end, L. Ron Hubbard instructed auditors on how to disseminate—specifically providing them with The Scientologist: A Manual on the Dissemination of Material, on how to conduct a field activity, and “Start That Practice!”—urging auditors to carry the torch and telling them how to be a success. Thus, as fall 1955 arrived, with a centrally located Founding Church of Scientology, a fully functioning Academy and the resources for dissemination at hand, Scientology stood poised for its next, entirely new phase of expansion.